2016 Best Sports Betting Provider / CEEGC Budapest. In addition, the company holds many licenses from different countries. Currently, Every Matrix Group is licensed in Malta, the United Kingdom, Denmark, Ireland, Russia, and the Netherlands, the Antilles. They are also the owner of an ISO 27001 certificate, which is given for information security management systems. You may also remember them with a different name if you like sports betting: OddsMatrix. Since Every Matrix is also a white-label company, it provides all the necessary infrastructure systems (such as payments, player handling, affiliate system, etc.) of online casinos. This is the case for Play Frank too: Every Matrix is the sole provider of everything related to the casino. This makes the website more secure, efficient and eliminates the need to use a third-party service when a problem happens. Play Frank is licensed by Malta and the United Kingdom Gambling Commission. It also encrypts all of its pages with 128-bit SSL to provide maximum security. Since the ISO 27001 certification of the group also applies to Play Frank, you don’t need to worry about information security. Play Frank applies restrictions to certain countries but doesn’t provide a list. However, according to the terms of its licenses, you can’t become a member if you reside in one of the following countries: Turkey, Australia, the Netherlands, Bulgaria, the Czech Republic, Estonia, France, Greece, Romania, Slovakia, Ukraine, and the United States. Players from the UK are accepted. If you live in a restricted country, you won’t be able to fill the membership form. The overall design of the Play Frank website is stylish and practical. It resembles the design of Casumo. The links you are going to use more often are located on the left side of the interface. To signup & login, you are going to use this section. The main page lists the most popular games and active bonuses. There are no navigation problems, and you can easily understand what you need to do. The website is coded with HTML5 so that it can be viewed on all mobile devices. Play Frank does not offer a separate mobile app, but the mobile version of the site provides a satisfactory experience. Page loading speeds are top-notch on both desktop and mobile versions. The website can be viewed in 5 different languages. Play Frank complies with responsible gaming practices, and it is possible to put limitations to your account. For example, you can limit the days you are allowed to play, your balance, and the games you can play. 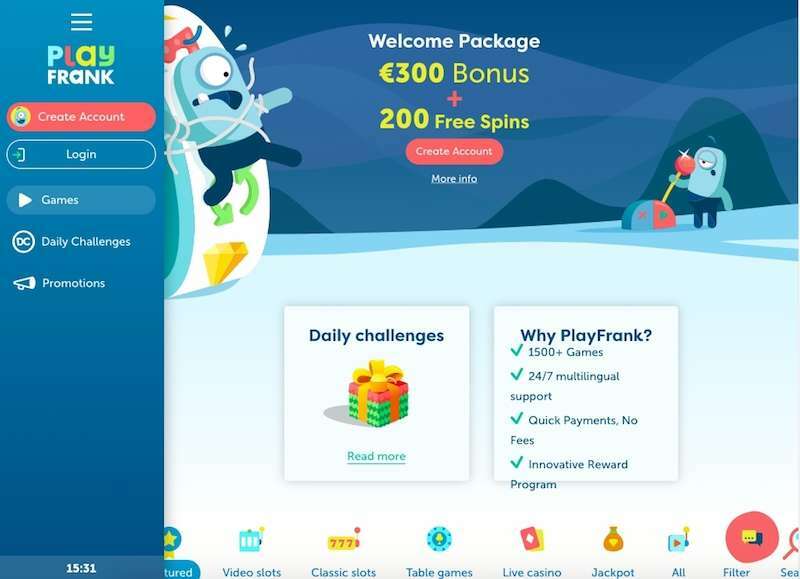 Currently, there are 5 different bonus promotions at Play Frank. We are going to list all of the below, but remember that some of these are time-limited bonuses. In other words, you may not see all of the listed promotions when you visit the Play Frank site after this review is published. Nevertheless, you can be sure that there will be new promotions offered. Like many other successful online casinos, Play Frank also regularly organizes different bonuses almost every month. Minimum deposit amount is 20 EUR at each stage. Free spins can only be used at Starburst slot machine. You can start using your free spins immediately. In fact, you must use them within 3 days, otherwise, they are deleted from your account. However, in order to withdraw your cash winnings, you must complete a wagering requirement of 35X first. To complete the requirement, you must wager the total amount of deposit + bonus 35 times. So, for example, if you get the full 300 EUR from the campaign, you must wager 10.500 EUR + deposit amount first. You must complete the wagering requirement within 7 days after you acquire it. Otherwise, it will get deleted from your account. Until the requirement is complete, the maximum bet you can place is 5 EUR at all games. Only video slot machines contribute 100% towards the wagering requirement. All other slots contribute 50%. Other games (card, table, etc.) contribute nothing. Once the wagering requirement is complete, your bonus funds will be transferred to your usable balance automatically. You can track the process from the “rewards” section of your account page. Once the transfer is completed, you can withdraw the bonus funds and/or use them to play more games with real money. Players from the following countries cannot benefit from this bonus: Bangladesh, Kazakhstan, Malaysia, Mongolia, Nigeria, the Philippines, the Republic of Moldova, Russia, and Vietnam. Winter Celebrations: Each member of Play Frank gets certain goals to reach. At the moment, there is a “winter challenge,” and you are asked to complete specific tasks (such as playing a certain number of games, reaching a certain bet amount, etc.). With each task, you gain a level. And with every level, you get random prizes (such as free spins, personal bonuses, etc.) The higher your level, the better your rewards. Currently, the big prize for this challenge is a real-world hot air balloon tour and the winner will be chosen randomly. Free Spins for Wins: Your deposits on a certain slot machine (Warlords: Crystals of Power) gives you different amounts of free spins to be used on the same machine. 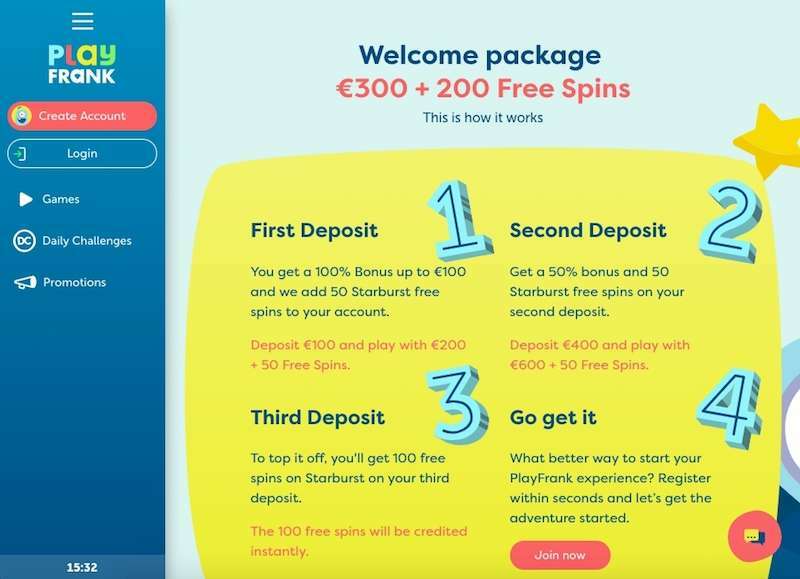 By depositing 20 EUR, you get 20 free spins. 50 EUR deposits get 50 free spins. If you win a prize while using these spins, you need to complete a wagering requirement of 40X. Daily Challenges: If you see a hot air balloon icon next to a game’s icon, this means that the game is eligible for a daily challenge. The challenge can be anything, for example, “wager on this game and activate two bonus rounds”. Each completed challenge will fill your progress bar. Once you have filled the bar completely, you can win a random prize (bonuses, more free spins, etc.) You can fill the bar more than once, and each time the rewards get better. Minimum deposit and withdrawal amount is 20 EUR. Maximum withdrawal amount is 25.000 EUR per month and 10.000 EUR per week. However, progressive jackpot wins are not subject to this limitation. Your preferred withdrawal method should be the same as deposit method (i.e., if you made a deposit with a credit card, you must make a withdrawal to the same card). You need to pay a fee for every method, but their rates are not fixed. Check your account page to see the actual rates. Withdrawal amounts less than 2.300 EUR are not subject to ID verification. But you need to verify your identity for amounts higher than that. Unfortunately, the progressive jackpot category was not active at the time of this review, so we can’t recommend games for that category. Note that other than some really old video poker titles, you can play the entire game collection on mobile devices without a problem. The RTP rates of the games are not announced to the public, but they are monitored by independent audition agencies. There are 51 live dealer games in total, and it is possible to find a live game at any time of the day. This service is provided by Evolution Gaming and works on mobile devices too. Live Chat: Available 24/7 via the website. At the bottom right corner of every page, you are going to see a pink floating button. Click on this button to start the live chat. No telephone or any other support method is provided. However, you can also use this postal address for inquiries: Level 5, Suite 1A, Portomaso Business Tower, Vjal Portomaso, St. Julians, STJ 4012, Malta. Play Frank is one of the best online casinos you can find. Whatever type of player you are, you can be sure that there is an option for you at Play Frank. The only criticism is the lack of telephone support, but this is a minor detail. The website is easy to use, doesn’t contain unnecessary elements and each page loads in mere seconds. The game collection is so big, you are going to need months to try all of them. And personal goals & daily challenges is a wonderfully designed system to encourage you to log in every day. Thanks to this system, you feel like you are accomplishing a goal while playing. We recommend Play Frank to any player out there – you won’t be disappointed. Play Frank Casino I started a long time ago. In this casino there are various gambling games that have pleased me with their diversity, as well as a good game! I note that in this casino are quite good bonus offers for players. You can replenish and withdraw problems through popular payment systems! 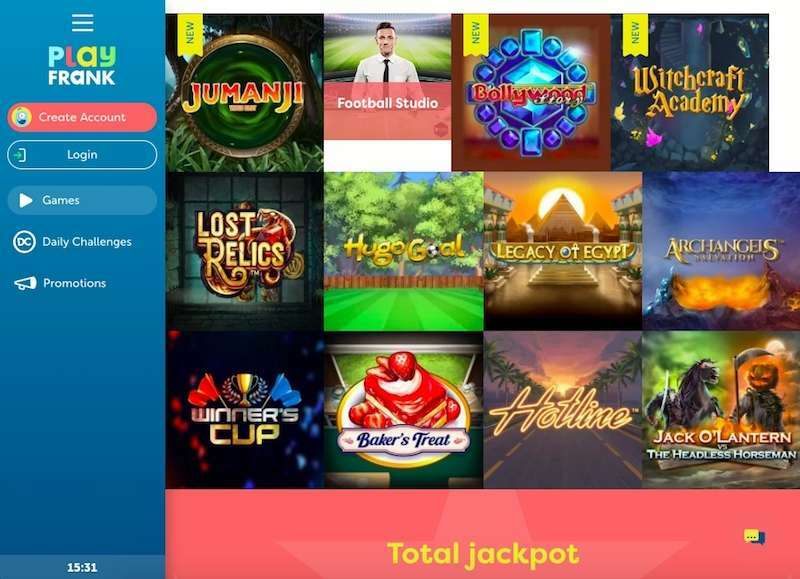 When I first visited this casino site I really liked the bright design and convenience when looking for games for money! WOW !!! Really, everything is convenient and simple. In this casino, I won many times and I have no complaints. I recommend to everyone.